The Big Idea for my solo show came from a juicy “What If”: What if this interesting, sculptural, probably-Bakelite found object (the base seen in the photo) could be a game board? Wonder what kinds of games are played on a 4×4 grid? Short answer: puh-lenty! 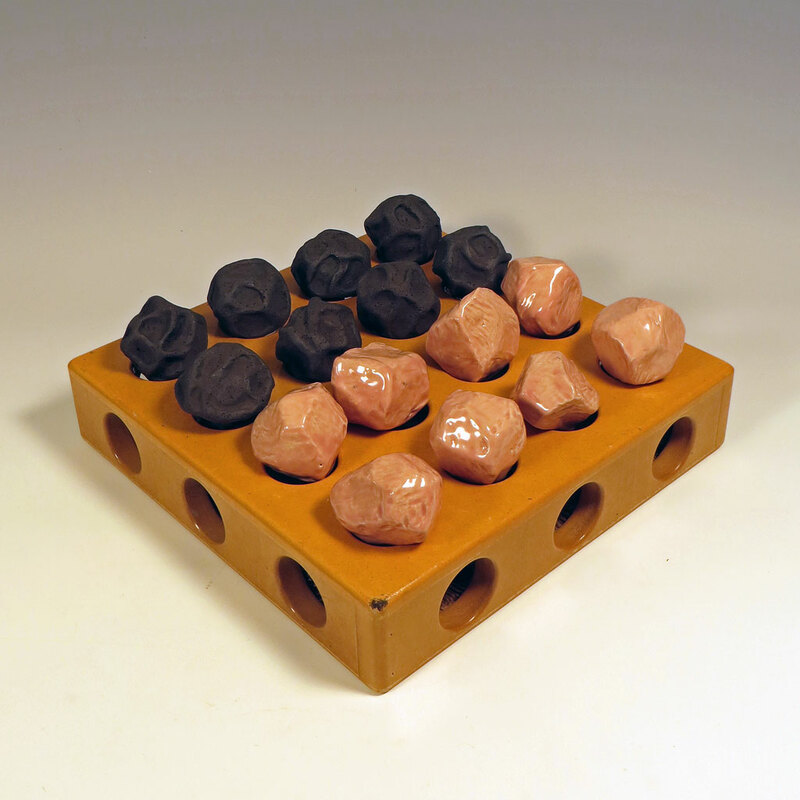 After that first endeavor, which resulted in “Crystals and Corns” – more about it below – I wondered what other kinds of games (besides the obvious chess set) would lend themselves to ceramic interpretations, both with and without found objects. When I realized a cache of carefully created games would be a fascinating venture and display, it was – and, yes, I’m gonna say it – Game On! I am inclined to over-research my inspirations and follow them to their tattered edges of possibility. Inclined? Hell, I require it, wallow in it, spoon-feed it to my dreams. It just might be That Thing I Do Best. I over-gather, over-list, over-sift and over-recombine my ideas; basically I over-think the whole megillah. I wait until I am woozy with possibilities, and then the next step (curating) always appears and I jettison most of them. For me there are no shortcuts in this Sweep-Encircle-Discard Method because it excites and fulfills me and mitigates the fear that I might miss a pivotal something. For this Series, I soon realized that what fascinated me the most is what are called Abstract Strategy Games. They are essentially games without much of a story or environment: just the physical structure of the board/playing pieces and the rules of engagement. The Wiki article linked above calls them “…a series of puzzles the players pose to each other,” with little to no randomness or hidden information, relying on the players’ canniness or lack of it. Think Chess, Checkers, Mancala, and Go. And meet some new combinations in this collection! My artistic mission is to create visually interesting sculptures which also happen to be playable games. Let’s look at the first one. Crystals and Corns gets its name from the oversized, pinch-formed Pink Salt Crystals and Black Peppercorns which are the playing pieces. They are pleasantly weighty and textural to handle and create a slightly improbable display at rest. The two versions you can play with this simple game grid are all quickly learned and quickly played, and they are more deterministic than something as cinchy as Tic Tac Toe. The first game is set up like the photo above: eight playing pieces for each player in two rows on either side. It’s based on a Korean game called Four Field Kono and the play involves jumping and capturing, trying to have the last Crystal or Corn standing, or to block your opponent so they cannot move. If you want to know more History and Gameplay specifics for Crystals and Corns, you can read about Four Field Kono or Dao with these links. I look forward to sharing one or two sculpture/games at a time with you in upcoming posts, and I really mean it when I say I haven’t finished the last two games. I have one of them pretty much in hand and should finish soon. But a serious straggler waits in my studio: a 3D organic gameboard which is a solid log fashioned from an entire 25# bag of clay. It needs hollowing out, surface details, lots of drying time, bisque-ing, glazing and firing. A lot can still go awry, so keep a good thought and send it to the Studio Elves and Kiln Goddesses here at my place! –Liz Crain, who’s been working on this series for just about nine months now. Time to get it “borned” and be on to the Next Thing. Writing about it helps her understand what she hath wrought from a meta-perspective and that’s part of her process as well. March 1 – 31, 2018, Roscoe Ceramic Gallery, 473 25th St. Suite 5, Oakland, CA, 94512. 415-515-3174. Receptions: First Friday, March 2 from 6-9 and Third Thursday, March 15, 6-8. Brilliant, clever and fun!! I like your adventurous spirit, pal. Thanks for sharing. Thank you! Whatever they call you, I call you Friend and I so appreciate your enthusiasm!